Cross-Contamination is very likely at Domino's Pizza. 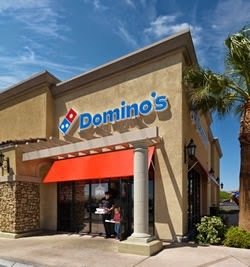 If you have a sever gluten allergy or celiac disease, Domino's is not your best restaurant option. However, I have celiac disease and I have eaten Domino's Pizza many times without a problem. So, use your own judgement and be aware of the risk. This menu is provided by TheGlutenFreeMenu.com as of 2014. The Gluten Free Menu is not associated with Domino's Pizza® Please check with the listed company before consuming any food items. We are not responsible for any information that is incorrect. This menu is only a guide and it should not be relied upon without checking with the local branch of the business.